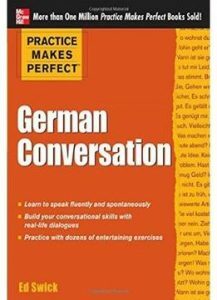 Practice the art of conversation in German! Want to strike up a conversation with a native German speaker but are nervous that you’re not ready? Practice Makes Perfect: German Conversation helps you overcome that obstacle, and—before you know it–you’ll be speaking comfortably in your new language. Inside you will find realistic conversational situations, from meeting people to talking about sports to discussing current events to just having fun. With these engaging dialogues as a starting point, each unit is packed with helpful instruction on correct grammar and word usage—in addition to lots of conversation-ready phrases that will be indispensable as your fluency increases. Of course you’ll get plenty of practice, practice, practice using your new conversational skills. Each dialogue is followed by a variety of exercises that not only give you the opportunity to put new concepts into action but also encourage you to construct personalized conversations. These lessons will reassure even the most hesitant speakers that they too can achieve a confident–and spontaneous–speaking style. Before you know it, you’ll be confidently speaking German with your German-speaking friends–or you’ll be ready to make new ones!